Spain, 2009, 128 minutes, Colour. Rachel Weisz, Max Mingella, Oscar Isaac, Ashraf Barhom, Michael Lonsdale, Rupert Evans, Sami Samir. Agora is not a film which will draw large audiences. It is a film for those who are interested in and entertained by historical films and by those who would like to see a film which dramatises a period, not well known at all, in Christian history. Some reviewers who have seen the film suggest that there is a need for some kind of historical background, especially about the Church in Egypt, in the city of Alexandria, at the end of the 4th century and the beginning of the 5th century. But, first some words about the overall impact of the film itself. The film is impressive to look at, a combination of sets and computer generated locations. It was filmed in Malta (with a fair percentage of the population seeming to be present as extras, lots of crowd scenes). It runs for 128 minutes, which is quite demanding for a film about such an unfamiliar period. It was directed and co-written by Spanish director, Alejandro Almenabar (whose varied films include, Open my Eyes (remade as Vanilla Sky), The Others and the drama about assisted suicide, The Sea Within). The film is also quite demanding in its content and dialogue. The central character is the renowned pagan philosopher, Hypatia. She is played with some authority by Rachel Weisz. Her philosopher father, Theon, is played by the French actor, Michel Lonsdale. Several sections of the film, some lengthy, are classes and discussions about the nature of the universe and speculation on the Ptolemaic theories of the relationship of the earth to the sun and the planets and how the stars move - or does the sun, or does the earth? Audiences who are not strong on astronomy or geometry may find these sequences too difficult, even baffling. But, it is quite a daring thing to present a feature film which raises these issues and asks its audience to think about them. However, it is the religious background of the film which needs some explaining. By and large, the screenplay is accurate enough, especially about Hypatia, Orestes the governor of Alexandria and Sinesius, bishop of Cyrene, a pupil of Hypatia, who demands an assent of faith from her at the end of the film but who actually wrote in defence of her theories and died before her murder. There are problems with the presentation of Cyril of Alexandria, bishop of the city, later declared a saint and an important doctor of the church with his contributions to the theology of the humanity and divinity of Jesus. The film might have been more satisfying for those who know something of the period had it alerted the audience to the fact that relations between pagans, Christians and Jews were not quite as straightforward as they are presented here. While it is accurate enough in general, there is much more to the feuds, hostilities, persecutions and massacres. The 4th century was one of the most difficult in the Church's history and the source of much of the difficulty was, in fact, Alexandria. From the 2nd century AD, the centres of intellectual debate and theological argument were in the schools of Alexandria and Antioch. By 300 AD, there were great developments in sophisticated theological thought in Alexandria. Agora does not really reflect this reality of the Alexandrian Christians. We see the Christians reflecting on the Scriptures (the Beatitudes in particular), the bishop preaching to the faithful and, later, the reading of texts from Pauline letters which are restrictive on the activities of women in the Church. But – and this may have been the case - most of the Christians are not well educated and easily swayed by populist demagogues, one of whom challenges the pagans to walk through fire unharmed as he does. He is seen as a miracle worker – the dared pagan goes up in flames. However, this is balanced by the same man showing a convert slave the ordinary miraculous in supplying bread for distribution to the poor. Reasonable enough and a fairly sympathetic view of Christians. But, what had been most important in Alexandria at the beginning of the century was the teaching of the local priest, Arius, whose understanding of the relationship between the Father and the Son emphasised the humanity of Jesus as somehow making him inferior to the divine Father. His opponent was the bishop of Alexandria, St Athanasius, who found himself exiled from his city more than once. The historical complication was that this was the time when the emperor Constantine declared that Christianity not be a banned religion, 312 AD. Clashes, both ideological and physical, between pagans and Christians, spread throughout the empire as did the response of governors to the new situation, some for, some against. While the Church resolved the Christ issue at the first of the ecumenical (worldwide) councils in Nicaea, a suburb of Constantininople, in 325, and enshrined it in a creed formulation that is still recited on Sundays at Masses around the world, the followers of Arius, maintained their stances and influenced a number of political rulers who used their adherence to Arianism to combat bishops. This would have been the case at the time of Hypatia. This could have been incorporated into some of the discussions in the film which would have heightened the reality of the persecution of the Christians by the pagans which resulted in fanatical and violent response, massacres in revenge for the killing of Christians and vandalism in destruction of the world's greatest library. Hypatia, declaring herself a seeker after truth and an investigator of the universe, escaped the attacks and survived. Further councils in 431 (Ephesus) and 451 (Chalcedon in Constantinople) led to further work on the theology of the humanity and divinity of Christ. The second half of the film takes place in 415, the year of Hypatia's death. The bishop of Alexandria is Cyril. Checking Google references for him shows that he was as irascible as portrayed in the film. He fomented clashes with Orestes who had become a Christian as had many of the pagans and rulers. Another of his targets was the Jewish community. There is a similar difficulty in the portrayal of the Jews as stone throwing zealots and then victims, though not as viciously fanatic as some of the Christian zealots, especially a group of monks who patrol the city supervising morality. There are records of Jews being in Alexandria since the early 6th century BC, the prophet Jeremiah and others fleeing there after the destruction of Jerusalem and the Temple in 587. Much intellectual reflection on the Jewish scriptures and the translation of books from Hebrew to Greek were done in Alexandria. The book of Wisdom, accepted in the Catholic biblical canon comes from this city in the 1st century BC. It is said that John's Gospel was influenced by the Alexandrian philosopher, Philo. Which means that at the time of the Jewish- Christian clashes in the film, Jews had been a significant part of Alexandria and its intellectual life for about a thousand years. An Egyptian historian, Damascius, claimed that Cyril was responsible for the death of Hypatia and her very cruel martyrdom. Agora's screenplay follows this. Historians say there is no other evidence that this is exact – some 19th century authors took it up again. However, historians do say that Cyril's bitter approach fomented the pervading atmosphere of hostility which led to Hypatia's death. 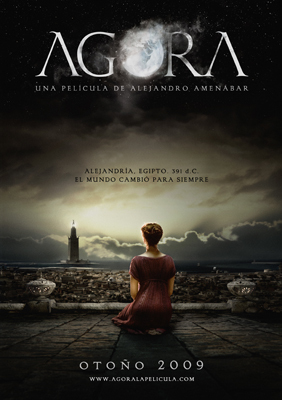 So, there is much in Agora for audiences interested in films which dramatise unfamiliar periods of history. And, it may be more accurate than many others. The above background might have been incorporated into the screenplay to make it more solid and nuanced. While initially the pagans are shown as clinging to their gods and to their own civil status and initiating persecution of the Christians, the Christian response (which was regrettably repeated down the ages, think St Bartholomew's Day massacre of 1572 against the Huguenots) is rabble-roused fanaticism. With the Jewish- Christian clashes, there is a huge heritage of history and persecution which puts the sad experience of the 20th century in the audience's mind. At the end, Hypatia is presented as a martyr and quite movingly declaring her own integrity (rather than faith) and bravely and heroically facing her death. This is strongly reminiscent of, even parallel to, the way that the Christian martyrs were portrayed in the storytelling of the early church. Actually, there was much more vitality and sophistication in the Christians churches of this period. St Ambrose was bishop of Milan at this time and St Augustine repented of his past in 397 and became the leading theologian of the western church. When Hypatia died, he was bishop of Hippo further west from Alexandria in north Africa, not all that far from the film' real character, Sinesius, bishop of Cyrene. By the middle of the 5th century Attila the Hun was at the gates of Rome, barbarians at the borders and the western empire was on the verge of collapse. Amenabar himself says that the film is not against Christianity but 'a film against fundamentalism, against those who defend their ideas with weapons. It is not against Christians and most certainly not against the Christians of today'. 1. The ambition of the film, scope? Themes? The potential audience? 2. Audience knowledge of the period, important or not? The information given in the film? 3. The visuals, the re-creation of Alexandria, the overview, the Google Earth style? The world of Alexandria, astronomy and science? The visuals of the city, the buildings, the public areas, the library, temples, school? The attention to detail? 4. The film as spectacle, the huge cast? The interiors and exteriors? The score and atmosphere? 5. Egypt in the 4th and 5th centuries? The city of Alexandria and its culture, intelligence and philosophy? The world-famous library? The pagan world and its temples and customs? Christians and the changes in society? The role of the Jews in the city? The factions and their violence? 6. Hypatia as the focus of the film? A feminist perspective? Rachel Weisz and her screen presence? Dignity, intelligence? Hypatia and her father, their working together, the discussions? Her study? Teaching, the questioning of the pupils, the response of the students, their devotion to her? Davus as her slave, attentive, in love with her? Themes of astronomy, metaphysics, geometry? Her research? Her faithful assistant? Rethinking categories? Demonstrating geometry? Davus and what he built to illustrate the planets? Her demonstrating the nature of the ellipse with Earth and sun? Her contribution to thinking? Her role as a scientist, her lack of religion and faith, her integrity and authenticity? 7. The range of students, the classes, her questioning them, their answers? Orestes and his seeming indifference? Sinesius and the Christian students? Davus and his listening? The later meeting of the students, their respect for Hypatia, Sinesius and his critique? 8. The world of the pagans, their leaders, their angers at the Christians, superiority attitude, the planning of the attack, the infiltration, the murders? The gods, their prayers and rituals, their beliefs? Theon, his love for Hypatia, yet his making decisions of life and death in favour of the pagans? His finally being injured and dying himself? 9. The Christians, the communities, the factions? Ammonius and the demonstration of walking on fire, the question of miracles? The pagans catching fire? Davus and his observations? The audience seeing the Christians through his eyes? His discussions with Ammonius, Ammonius taking him to feed and give bread to the poor? The reading of the Beatitudes and the comment on the Beatitudes? The bishop reading the Scriptures to the faithful? Images of the best of Christianity? 10. The Christian reaction to the pagan attack, the hordes, pursuing the pagans, besieging them? Ammonius as a demagogue? Davus and his identifying with the Christians, his conversion? 11. The end of the 4th century, the Roman Empire on the verge of collapse, the role of Egypt, change and transition? 12. The 5th century, an uneasy peace, fewer pagans, more converts? The Christians and their rise to authority and status? The death of the bishop, Cyril taking over and removing his ring from the dead body? Ammonius and his continued enthusiasm? The monks patrolling the streets, watching morality? Their garb, Davus as one of them? His growing up, more mature, growing a beard – yet the touch of fanaticism? 13. Hypatia and her continuing her study, her age, not marrying? The background of Orestes, his playing the instrument in the theatre, her offering him the handkerchief with the blood? Her not wanting to marry? Orestes as governor, Sinesius as Bishop of Syreni? 14. Cyril, fomenting agitation, attitudes towards the pagans, towards the Jews? The attack on the Jews in the theatre on the Sabbath, lecturing the Jews about the Sabbath? The Jews and their casting stones? The leaders being brought before the governor, pleading their cases? Cyril and his threats? 15. Davus, his life, the continued infatuation with Hypatia, with her during the siege, the taking of the manuscripts from the library? Her giving him his freedom? As a monk, still watching Hypatia? His sword and blood, participation in the violence and massacres? 16. The final scene with Hypatia and her assistant, the discussion of geometry, the discussion of the movement of the earth, her demonstration of the ellipse? 17. Cyril, the other bishops, Sinesius and his pleading with Orestes? Cyril holding the Scriptures, bidding all the authorities kneel, Orestes refusing? Feeling he could not? Cyril targeting Hypatia through him? Ammonius, his bitterness, throwing the stone at Orestes? His being killed – and Cyril declaring him a martyr? 18. Hypatia as victim, knowing what was to happen, her arrest? Hurried to the temple, seeing Davus? Davus coming, embracing her, smothering her to save her the pain of the torture and her being flayed alive? 19. The fall of the Roman Empire soon after? The contribution of Alexandria to culture? Its collapse? The picture of religion, fanaticism and factions?